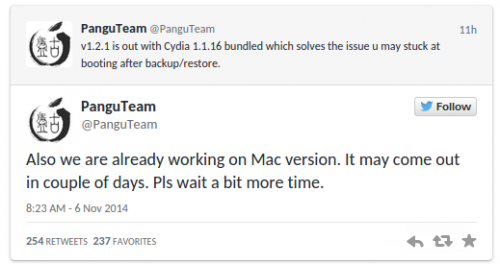 The release of the utility for untethered jailbreak for iOS 8 - 8.1 comes right in time. You see, quite soon the guys from Cupertino will officially release iOS 8.1.1, which kills jailbreak and stop signing the older version of the mobile operating system making it impossible to restore jailbroken devices to older version of iOS in case something goes wrong during the process of jailbreaking. The team states that they are already working on a Mac version of their popular tool, and that a release is very close, perhaps only two days away. It’s bittersweet news in light of the recent iOS 8.1.1 beta release. Stay tuned for more news related to the untethered jailbreak for iOS 8 - 8.1. We'll let you know as soon as the utility for Mac is released.